The CTLT is committed to supporting faculty who are interested in teaching online courses at Cal Poly. We offer a variety of opportunities for hands-on course development resources, help with the Curriculum modification process, and informal reviews of your course. 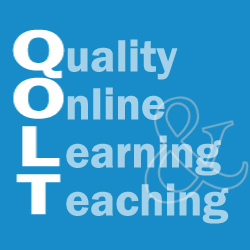 We adhere to the CSU standards for Quality Learning & Teaching (QLT) - the QLT Instrument is a set of rubrics and feedback tools built to encourage quality hybrid and online course development. Every year, hundreds of online and hybrid courses are submitted to the CSU for this recognition award. The CTLT will support all Cal Poly instructors interested in preparing their online and hybrid course for the nomination process. Please review the Curriculum Handbook for information about submitting your course modification proposal! The Quality Online Teaching Academy will be offered again in 2019-20, and our four-week fully online boot camp begins on July 14, 2019 and ends August 9th. First priority is given to participants of the QOTA, but remaining seats are available on a first-come, first-serve basis to those interested in learning more about creating online courses. More information will be available soon! The CSU Chancellor’s Office, Academic Technology Services has established a “Formal Course Review” process for online courses across the 23-campus system. Utilizing a team approach, three certified CSU reviewers analyze each course from the student perspective and apply the QOLT or QM instrument to the course, providing affirmation of quality components, as well as feedback for areas of improvement. The goal is to have each reviewed course obtain at least 85% of the points possible while meeting all core standards in the instrument being applied. Once the course meets these criteria, the instructor receives a certification letter and is given a unique certification mark they may place inside the course (e.g, LMS header of the course). Courses meeting this level of certification are also recognized on campus and system wide websites. Please visit this page later for information regarding the 2019/20 review cycle. There are ten standards and a total of 58 objectives in the QLT Instrument. The CTLT offers a variety of workshops that support the rubric and goals of the QLT recognition program. The Quality Learning & Teaching Instrument is comprised of 58 objectives organized into ten sections.